Guess what? I increased my Pinterest and blog traffic by over 800% in less than two weeks, 10 days to be exact! My Pinterest traffic increased by over 1000%. Yes, you read that right. 1000.%. And I didn’t have to pay a penny. It was super easy with the help of McKinzie from Moms Make Cents I was able to increase my Pinterest traffic and in turn increase my blog traffic by following the steps laid out in her course called Pinterest Primer. Pinterest Primer is a FREE 5 day email course created by McKinzie from Moms Make Cents that literally gives you step-by-step instructions on how to increase your online traffic! McKinzie literally spills the tea on how she went from 0 to 20,000 monthly page views in two months and how she earned nearly $2,000 in her first 90 days!! Who would want to miss out on this?! A fool, that’s who. Go ahead and try it out for free here. I’m so happy I decided to enroll in this course! I’ve learned so much about Pinterest. I’m still getting the hang of it but I’ve already seen such amazing results. I’m excited to see what will happen when I continue to implement her tips. I’m ecstatic that my blog has experienced an increase in traffic due to all the work I’ve done on Pinterest. Did you know that Pinterest is considered a search engine? It comes second to Google in popularity! That’s major! Pinterest is one of the major ways bloggers’ get traffic to their sites. Since enrolling and following McKinzie’s steps exactly, my website has gotten more views in one day than it has in the 12 months I’ve had my blog. Crazy right?! I think it’s safe to say that she knows what she’s talking about. One would be foolish not to believe that her course produces results. I’ve found that pinning your blog graphics and posts on Pinterest helps a lot! Especially if you have a good amount of followers. It’s okay if you don’t have a lot of followers though, there are strategic ways to increase your following. I’ve even learned to join group boards. This is another way I have extended the reach of my pins and in turn increased the traffic to my blog. Joining and pinning in group boards allows a lot more people to view your pins and re-pin so that their followers can see. It’s a win to me! A tool that has helped me tremendously is Tailwind. Tailwind is a pin scheduling tool and it’s amazing! I usually carve out time in Sundays and schedule my pins for the week. It’s so easy and I don’t have to constantly pin on Pinterest every couple of hours, everyday, etc. because we all have lives and other priorities right?! Tailwind comes with a free trail and you don’t have to enter your payment information in order to do it. You get 100 free pins to schedule and you’re off. After that you decide if you want to continue and pay or not. I created my website around the end of November. As you can see above, I wasn’t getting any traffic to my website until a couple days later. On December 8, 2018, I had 10 users which easily surpassed my WordPress.com visits in 12 months! 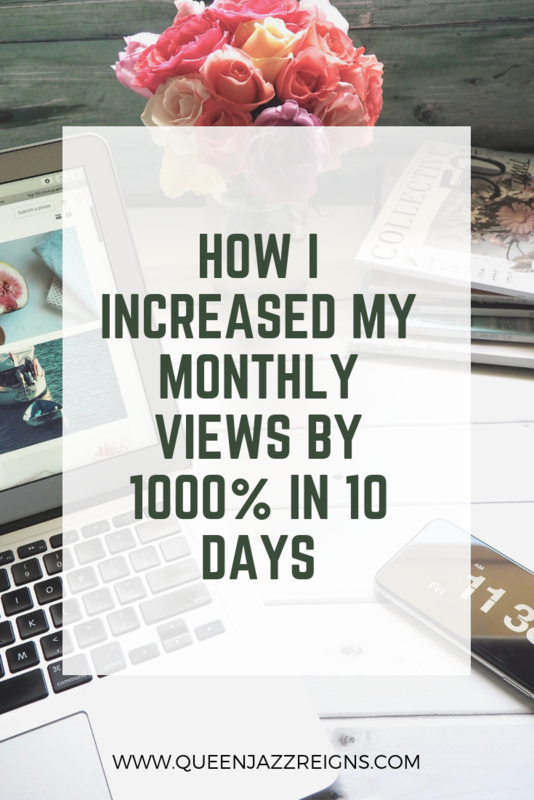 That may seem like a low number to you, but imagine not having any traffic for months, then trying something new and seeing results in less than two weeks! Since I’ve implemented the steps on Pinterest Primer I’ve have had 66 visits to my brand new website! I must say I am happy about that. I received the first email for the Pinterest Primer course on November 30, 2018. On December 1, 2018 I had 44 viewers and 5 engaged users out of all of my followers. By December 10, 2018 I had 180 viewers and 28 engaged users. That’s about a 400% increase in viewers and a little over 500% in engaged users. I’m still implementing the steps from Pinterest Primer and I expect my results to continue to increase. For all audiences, I began with 1,238 monthly viewers and 65 engaged users on December 1, 2018 and skyrocketed to 12,385 monthly viewers and 522 users engaged by December 10, 2018! I’m talking about a whopping 1000% increase in monthly viewers and 800% in engaged users. What a spike (see below)! My impressions (the amount of times my pins have appeared in feeds and searches) on December 4, 2018 was 133 while the amount of viewers I had was 65 for that day. Fast forward to December 10, 2018 and my profile had 792 impressions and 511 views in one day! Pinterest is a beast!!! I highly recommend that you enroll in Pinterest Primer, it’s free and you have absolutely nothing to lose and everything to gain! I also suggest that you look into the other courses that McKinzie from offers, I am sure are just as amazing! See below for a list of her other products.